NGD! 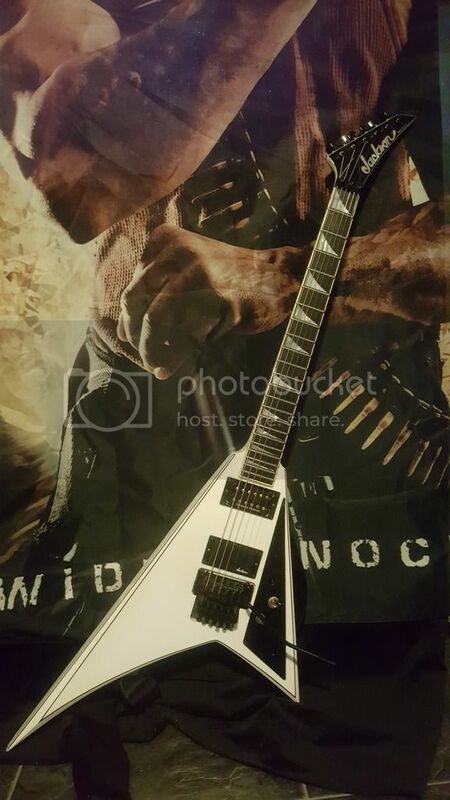 Jackson RR1 with Jackson J50BC pups! Discussion in 'Standard Guitars' started by Shrediablo, Jul 12, 2018. MrHelloGuitar, Manurack, arasys and 15 others like this. So how does the wiring work when you have a passive and active humbucker? Or is the neck humbucker not being utilized? The old J50BC (and J80, J90, etc.) are passive, despite the EMG-like covers. The Midboost circuit requires batteries, but the pickups would work without it. A lot of people are big fans of the J80/90Cs, but the J50C gets less love. I do wonder how that circuit would sound with a SD pickup though, I've never tried. Shrediablo and JustinRhoads1980 like this. Yes, that's right! 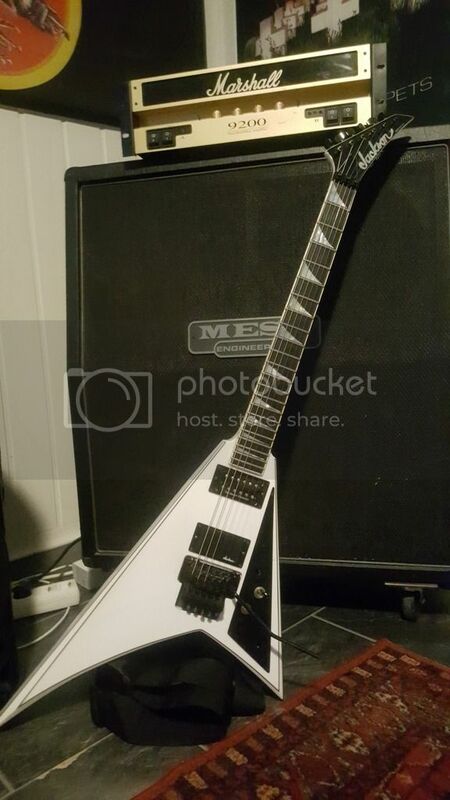 I wanted the J50BC because I love the early Alexi Laiho / early 80's Stone tones, but I bet those other Jackson pickups sound awesome as well! 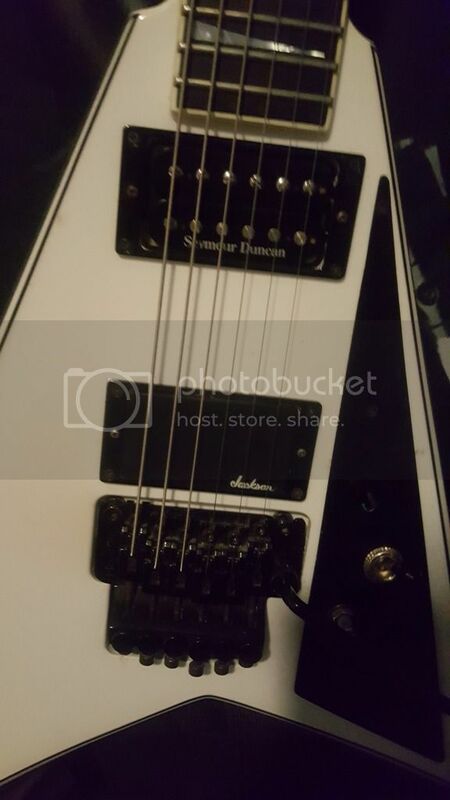 My buddy did the wiring for the boost which is on 100% of the time, I'm pretty sure the neck pickup uses the boost as well and I think that's a SD jazz pickup. Sounds good! Nice! I have jackson-made pups in my Charvel CRR, and they sound absolutely amazing. Congrats! Always loved the white with black pinstripes. If you ever want to get a new control plate with a custom layout, you should check out fretsonthenet.com. I'm really happy with the stuff Dave made for my 1992 Rhoads. He also made me some brushed alu pickup rings and trussrod cover and it looks awesome. The j50 is a great pup, sounds great on my charvel model 4. Wow, I'll consider that for sure, thanks for the info! Your axe looked pretty killer! FretsontheNet is the best place to get replacement/custom parts for Jackson guitars. Dave also created a single volume + toggle control plate for my Rhoads pro. I have also ordered stuff for my old 80's model series charvels from him. You can't go wrong when working with Dave. I agree the Jackson J50 pickups are great. 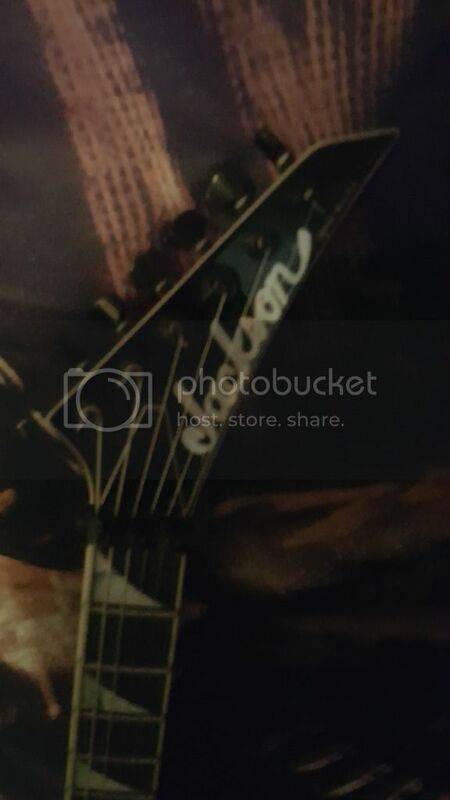 I searched out a set for the 88 Dinky I have and just love them for that guitar. McBrain and Shrediablo like this. Is the mid boost built-in on those guitars? I'd really want a JE-1500 or 1200 whatever it was Mid boost in my KV1 too. How does that Jackson pickup sound? Wooo nice. I need to find one to dump into my charvel.